late Dr Bhupen Hazarika was also a true patroit- Pema Khandu, CM,. Arunachal Pradesh . 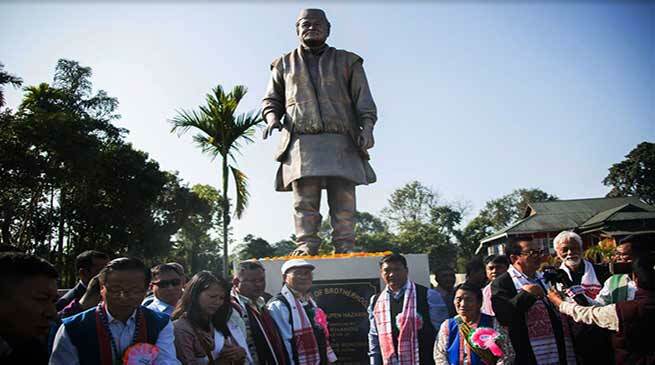 Chief Minister Pema Khandu today unveiled the 10-foot-high bronze statue of late Dr Bhupen Hazarika, also known as the ‘Statue of Brotherhood’ here at Bolung village in presence of DCM Chowna Mein, Dambuk MLA Gum Tayeng and Roing MLA Mutchu Mithi. In a function held to celebrate the unveiling of the statue, Chief Minister said late Hazarika had touched the hearts of many Arunachalis through his songs and films dedicated to the state. He said the legendary singer has traveled length and breath of Arunachal writing about different tribes and composing songs in local dialects. He said late Hazarika is a legendary icon that bonded the hearts of Assam and Arunachal through his songs, films and literary works. Chief Minister said late Hazarika was also a true patriot who through his songs wrote about the sacrifices made by the Indian Army during 1962 war. When Bhupen Hazarika died, along with Assam whole of Arunachal also deeply mourned his demise. Thereafter the Arunachal government decided to erect a memorial at Bolung in his memory, he said. Also to make the bond between Assam and Arunachal stronger and Assamese being one of the common languages spoken in Arunachal, Chief Minister said a proposal to make Assamese as a third language will be taken up in the cabinet. He said the language will not be made compulsory but the students will be free to chose among the third languages. Chief Minister appreciated the Arunachal Pradesh Literary Society (APLS) for their effort in erecting the statue of brotherhood and said it’s the symbol of unity between Assam and Arunachal. He also encouraged their effort in strengthening the relation between the two states. On the occasion, DCM Chowna Mein, Assam Power Minister Tapan kr. Gogoi, Chairman Assam Sahitya Sabha Parmananda Rajbangshi, APLS Chairman YD Thongchi also spoke. Family members of Late Bhupen Hazarika, members of AAPSU, AASU attended the occasion.